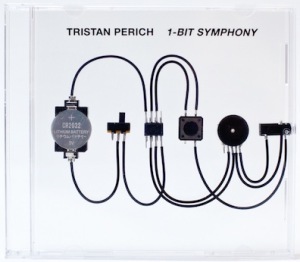 In addition to his work with live performances and visual art, Tristan recently released an album titled “1-Bit Symphony.” It’s an orchestral composition in five movements, using only 1-bit sounds, packaged in a traditional CD jewel case. The composition is programmed and performed live by an assembly of electronic circuits. You listen to it by plugging your headphones into a jack mounted in the case. 1-bit sounds are at the absolute lowest dynamic range possible. Consisting of simple square waves, they sound harsh and edgy. Not exactly the medium of expression you’d expect for an artist interested in the complex form of a classical symphony. The technique Tristan chose to present his work was also minimalist. He programmed and assembled by hand the absolute minimal amount of technology needed to convey his musical work. As human beings, we’re constantly searching for the ideal medium for our messages. And when faced with a desire to convey something very complex, the first thing most people do is look for similarly complex tools. We seldom embrace constraints. Yet that’s exactly what Tristan chose to do. There’s a powerful lesson in his choice. A lesson for pioneers exploring all types of mediums of expression. The unfolding of complexity appears within the art of constraint. I’ve written about how the development of more complex tools can increase the emotional bandwidth of communication and human expression. Complex tools are very useful and sorely needed to solve many challenges. But I have also touched on the idea that more is not always better and how our brain is really good at filling in gaps. 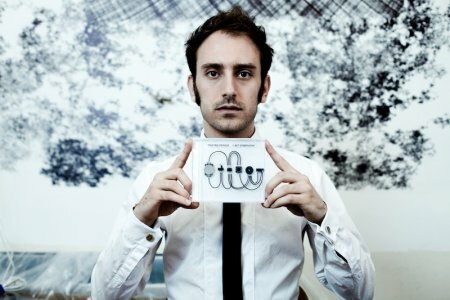 In many ways, the work of Tristan Perich is an enlightening example of that second point from an artist’s perspective. His symphony is stripped bare of the complexity of conventional sounding instruments. We are left with complex composition in an abstracted form. Listening to this challenges our mind to focus and amplify pure patterns of music. By working within constraints, particularly self-defined and self-imposed ones, we can reveal new depths of creative complexity. Some of the most engaging experiences ever designed were created in this way. Think about the simple rules of chess and how they give rise to a stunning complexity of gameplay. Or how poets share the most powerful ideas by deliberately paring down their choice of words to a bare minimum. For a visual example, simply look at your favorite painting by Picasso. If you look more closely at Tristan’s “1-Bit Symphony,” you’ll see another lesson as well. Creative expression lives within the forms of the tools themselves. Tristan didn’t simply release “1-Bit Symphony” as a conventional CD or collection of mp3 files. He took the tools he used to create the music and made them an integral part of his artwork. The careful layout of the electronic components is done in an creative way that makes you want to frame the CD. And the fact that you are holding a “live performance” in the palm of your hand creates a uniquely intimate relationship with the music. The tools for creative expression can evoke powerful feelings and inspiration. A violin is a work of art that is a delight to watch being played. The feel of a brush heavy with ink as it dances across a rough canvas is a joyful part of the creation of a painting. Building at the speed of thought in a virtual world while your avatar stands in the very middle of an unfolding expression of your mind’s eye is a breathtaking experience for both yourself and an audience of observers. Tools are not just a means to an end. And the most amazing tools are designed to inspire both those who wield them as well as those who witness their use. If you want to change the world, pay attention to artist pioneers. Is “1-Bit Symphony” a practical new way to create and share music? Will it revolutionize the business of music distribution? No. But it is a pioneering work that challenges the way we think about complexity and constraint while providing us with a very beautiful experience. Works like “1-Bit Symphony” prompt us to think deeply about the choices we make when creating and implementing tools for creative expression. So keep an eye out for people like Tristan Perich. For people creating and using tools in seemingly counterintuitive ways. You’ll learn to see the world a bit differently. You’ll learn new ways of expressing and sharing complex ideas. You’ll learn how to create unique tools that cultivate creativity and delight. Priceless lessons for all pioneers. This entry was posted in Art, Pioneer Lessons and tagged art, constraints, innovation, minimalism, music, strategy, Tristan Perich by John "Pathfinder" Lester. Bookmark the permalink. I’m going to be speaking about the future of the arts in virtual worlds tomorrow at “Art Breaker.” http://bit.ly/aHD6Fu The event is in Second Life, and I’ll be on at 1:30pm PDT. If you enjoyed this blog post, I’ll be expanding on some of the ideas I introduced here. and then you write all about an artist.. artists- whose main function is to reflect culture via mediation..using a media. are they “pioneers” as the term once meant.. searching for the new to be discovered.. or are they now just searching for what can be “resold” as new. – as virtuality noew has more value than reality in our psychotic Discovery hostage channel:) culture. artists pioneers? a mirror dosent discover the reflection. I really resonate with that idea. Although I get a lot of satisfaction from sharing the products of my work, the creative process is what’s most fulfilling. I love working within intentional constraints. For instance, there’s a real joy in figuring out how to realize a creative vision through the limitations of the iPhone platform instead of firing up Photoshop or Final Cut on a laptop. The lowly tweet is a good example of a very constrained format that people like @SecondLie have turned into a micro-art form. Machinima makers like Celestial Elf have been putting out really captivating work by embracing the relative limitations of Second Life rather than working through more powerful animation tools. For those of us who aren’t full time creatives, time is probably the most pervasive constraint. I personally handle the temporal challenge by usually working on projects that can be completed in a night or two. Anyway, thanks for another interesting post on a topic dear to my heart. This untapped creativity is what I hope to uncover with our NuOAR project for rehab purposes in our prison system. With OpenSim, as the basic medium, I want to see just what kind of world our “clients” create. Of course, they’ll have to learn to use the building tools, and yes, that will encourage them to read, and later write. And, those who do not read/write well will have to actually depend on someone else. Then the entire notion of “sharing” happens. The notion of “mentoring” and “leadership” and “dependence” happens. Even the notion of “Open Source” happens. It is far far easier to lead the horse to water, than to make him/her drink.